You place an order for a surprise jewelry theme box for yourself, knowing that it will be made up of pretty accessories you will love. The excitement builds up and anticipation sets in. The box arrives and you cannot wait to unwrap it. With much delight, the contents are finally unveiled. You try them on and love how it adds a brand new spark to your wardrobe, all specially handmade for you. Does that sound like fun and perhaps, something you would like to experience? Then allow me to introduce Adeline's Loft newest feature, 'Create My Style Box'. 'Create My Style Box' is something I have been working on the past few weeks. After much deliberation on details of the box and costings etc, I am happy to finally launch this today. It was really hard to keep it under wraps for so long! Nothing, and I mean nothing, beats the surprise element of receiving a few pieces of trinkets nicely packaged in a little brown box which is certain to please anyone who has a penchant for mixing and matching accessories! 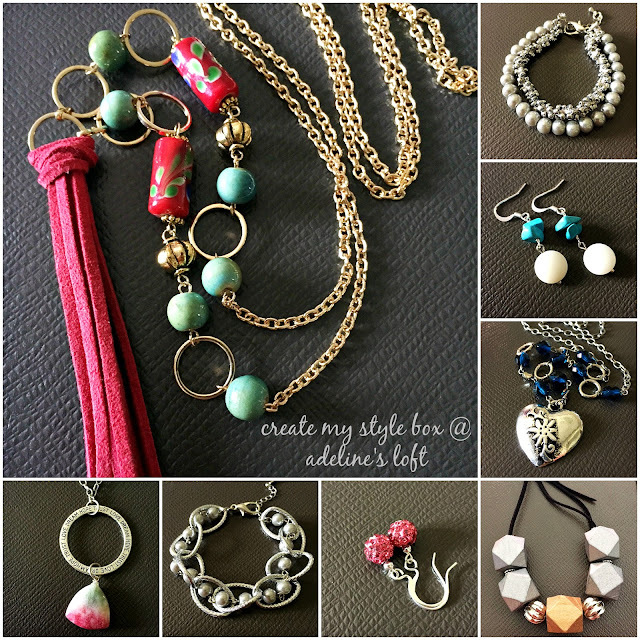 Of course, at Adeline's Loft, I am all about handmade jewelry. When you place an order for a box based on the selections made by you, I will get down to work on something that inspires me to create for you. I have always been big on exclusivity so most designs will be limited edition pieces. Regardless of the box value you choose, there will always be at least 3 items in your box. Choice of style and combination of jewelry pieces can be made in the order form. Here's a sample of what contained in the first 2 boxes made for 2 individuals, according to their selections. I have several affordable value boxes that you can choose from. Ranging from S$30 - S$60, depending on your budget. There are also boxes for the mini me in your lives at S$22. The actual value of a 'Create My Style Box' is worth far more than 40% of the listed box price, which is considered a steal as it is valuated by handmade value*. *For information on my individual custom order handmade prices, please refer HERE. How Soon Can I Receive The Box? As a general guideline, 1-2 weeks after transaction is made. Anything Else I Need To Know Before Buying This Box? First of all, if you are unfamiliar with Adeline's Loft, do take some time to browse through my past creations in my album. From there, you would be able to gauge the genre of designs I usually come up with. Local standard postage is free, which may take 2-4 working days to arrive. Smartpac service (door delivery, tracking service by Singpost) is a next day delivery at S$4 additional. Overseas order is also welcomed at a flat shipping rate of S$8.00 by registered mail. However, please allow a longer time frame for the arrival of the shipment as there could be delays during transition. Estimate time frame for overseas shipment between 2-4 weeks. Can I Return Any Items If I Don't Find It Suitable? As these are specially priced pieces made to order at a fantastic value, no alterations, returns or refunds will be considered. If any items happen to be dislodged/broken during transition, you can get in touch with me about it within 3 days from the receipt of your box to see how I can help you rectify them. How Is This Different From The Usual Customization Of Jewelry Pieces From You? The reason how and why I am able to offer special bundle rate for the box is because the one-to-one communication and unlimited mock ups of jewelry pieces my regular clients are familiar with, will be drastically cut down by 90%. Hence it allows me to be more flexible with time and the costs it usually involves. Thus the difference. I'm Ready To Place An Order and Support Local Handmade! That's really awesome! You can place an order through this form HERE. It takes no more than 5 minutes to fill in the form. Thereafter, you will receive an acknowledgement email with transaction details. Payment would be required to be made in advanced within 3 days from the email. Place an order for a box and receive 4* pieces of jewelry instead of 3! Awesome new product! All the best, Adeline! What a great idea! I know lately it seems like people love receiving deals in boxes, so I think a lot of people will want to order this from you. Good luck - I hope you have lots of sales! Wow! I want to received one...hope my husband find these page ASAP.^_^ More Sales to come!